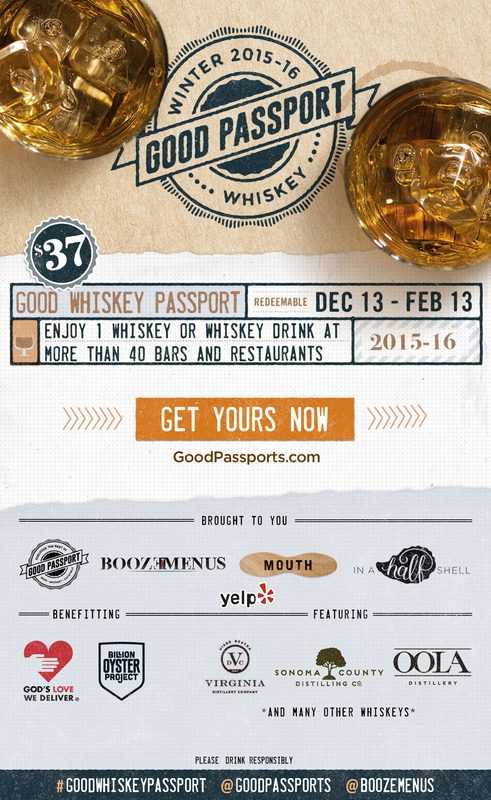 Good Passports, BoozeMenus, Mouth and Yelp NYC have teamed up to present the Good Whiskey Passport, which will raise funds for God’s Love We Deliver and Billion Oyster Project. By purchasing the Good Whiskey Passport, you’ll get one whiskey cocktail or a neat pour at every participating location. Each participating location will offer you the choice of at least 1 of 2 whiskey cocktails or a neat / rocks pour. Cocktails are based on 1 oz pours of liquor. You can use the passport on any day, at any time from December 13, 2015 through February 13, 2016. You’ll also receive a code for 20% off your next order from Mouth.com where you can find whiskeys like Oola, High West, Few and New York Distilling Co., gifts, indie food products and so much more. Click here to view the Mouth whiskey collection to get started. While your enjoying the Good Whiskey Passport you’ll get to try all kinds of whiskeys including Sonoma County Distilling Co, Oola Distillery, Virginia Distillery Company and many many more. A limited amount of VIP Good Whiskey Passports will be available for purchase. VIP Good Whiskey Passports come with a free bottle of Hella Bitters and can only be picked up at Mouth Inside Spirits & Wine Gallery. Thanks to help from our friends at In A Half Shell, 4 of the locations participating in the Good Whiskey Passport are offering you a $5 Oyster upgrade+ Just present your Passport and ask for the Oyster upgrade. For $5 you’ll receive a special oyster dish. When purchasing a Good Whiskey Passport, choose the location where you would like to pick up your Passport. Passports are available for pick-up from December 13, 2015 through January 13, 2016. Pick up your Passport at the location you chose any day from December 13, 2015 through January 13, 2016..
Bring your Passport to each of the participating locations any day from December 13, 2015 through February 13, 2016 and choose one cocktail from a participating brand at each location. + = $5 Oyster Upgrade available. *Mouth.com discount: Expires 2/13/16 at 11:59 p.m. EST. Must be at least 21 years old to purchase alcohol. Please drink responsibly. Our goal is to help you discover and get the best, most delicious and most interesting indie food products and to help indie makers grow their business. We are an member of The Specialty Foods Association, an affiliate of Fare Trade NYC and a member of the Good Food Merchants Guild. The Billion Oyster Project (BOP) is an initiative of New York Harbor Foundation that aims to restore one billion live oysters to New York Harbor over the next twenty years and in the process educate thousands of young people in New York City about their local marine environment. BOP is a partnership of schools, restaurants, businesses, nonprofits, and individuals all working together to restore oysters and make our city a healthier and more resilient place to live. Pro-tip — in the google map above, select “Share”, then “embed on my site”. On the new page that opens, hit Cancel, and then on the three dots pull down menu select “copy map”. You now have a copy in your own G+ account and can do things like mark locations with a different icon to indicate which you’ve checked off your list.